Geo TV Add-on – $19.99/mo. QTV Add-on Pack – $10/mo. PRIMARY URDU LANGUAGE TV PACKAGES. *BASE DISH PROGRAMMING PACKAGE REQUIRED. The Urdu Pak Mega from DISH is an unbeatable collection of the latest Urdu-language dramas, current affair developments, news, reality shows, game shows, and talk shows straight out of Pakistan! To order the Urdu: Pak Mega, contact your friendly DISH representative today. Urdu: Geo Pack – $29.99/mo. The international GEO Pack from DISH gives you everything you would expect from the highly rated Urdu-language network, offering you the best in soap operas, dramas, talk shows, news, music, and current affairs. To order the Urdu: Geo Pak, contact your friendly DISH representative today. URDU CHANNEL ADD-ON PACKS. *INTERNATIONAL BASE AND PRIMARY INTERNATIONAL CHANNEL PACKAGE REQUIRED. Urdu: GEO TV Add-on – $19.99/mo. To order the Urdu: QTV Add-on Package, contact your friendly DISH representative today. Urdu: QTV Add-on – $10/mo. 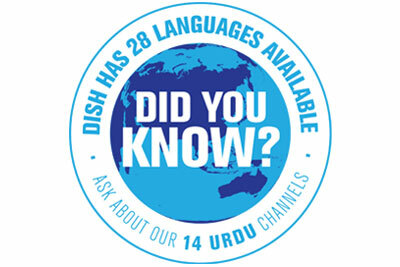 This 24 hour a day Urdu-language international channel from DISH comes to your living room live from Pakistan and features Islamic religious, educational, and informative content. QTV also offers programs on Islamic history and teaching/interpretation of the Holy Quran.